A successful life is made up of successful days. And a successful day begins with a successful morning. But how to create a successful morning? The answer: a morning routine. If you ever felt like you don’t have control over your days or that you don’t have a clear action plan, – then you will benefit from a well designed morning routine. Read below for 5 simple things you can start doing today to create productive and satisfying days. As Jim Rohn famously said: “The recipe for success is – a few disciplined repeated every day”. Successful people around the world know the secret of habits. That’s why they put effort to build healthy habits. And your best habits will begin with your morning routine. “Sticking to a routine has always brought me clarity of thought, positive mindset, and most of all, successful results for the rest of the day,” says Fran Tarkenton, an NFL Hall-of-Famer. Haruki Murakami, the most popular Japanese writer and possible future Nobel Prize winner, formulates it even better. “I mesmerize myself through the repetitive character of habits to reach a deeper state of mind”. It’s essential to keep routines. They keep your mind off trivial problems and let you stay focused on the important ones. 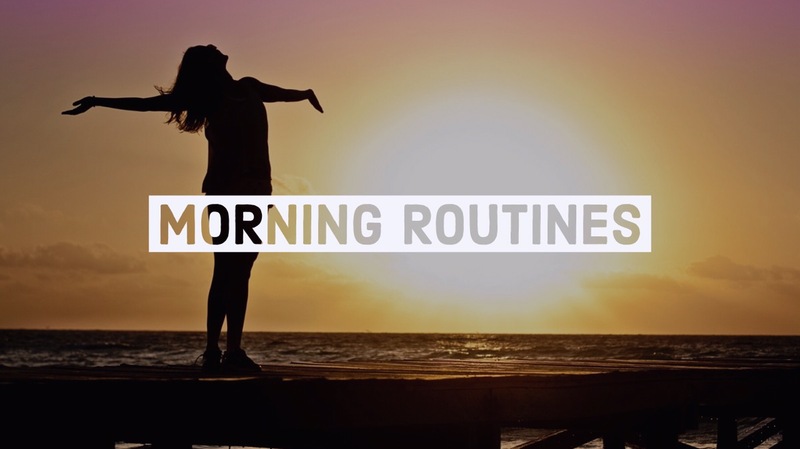 Keeping a morning routine means that you’ll never have to think about what to do when you wake up. You’ll simply start doing it. In general, there are 2 ways to go through your day, – you can be Active or you can be Re-active. When you are Active, you are in control of your day. When you are Re-active, you are Not in control of your day. You allow others to control what you do during the day. The best way to have control of your day is to “finish” your day before it starts. In other words, plan what you’ll do that day. It’s best to plan your day the evening before. Of course, if its not possible, then you can create your daily plan first thing in the morning. Making your daily plan ahead also helps you start your day without making decisions. Scientist proved that making decisions requires energy and “will power”. And you get a limited amount of willpower for the day. When you write your tasks for the next day before going to bed, you’re helping your brain prepare for them. While sleeping. So, put a reminder for Tonight to make a list of 5-6 items you’d like to get done tomorrow. That’s right: contrary to popular opinion, you don’t need to be an early bird. Because it really doesn’t matter when you wake up. What matters is if you know what to do afterwards. For example, Benjamin Franklin woke up every day at 4 AM. Barack Obama is still waking up about 3 hours later. Winston Churchill stayed in bed until 11 AM. It’s safe to say that they all made the rest of their days worthwhile. And don’t forget: all of them had entire countries to run. Nicely visualized here, the sleep habits of some of the world’s greatest writers tell the same story. Balzac barely slept (waking up at about 1 AM) and Tolstoy woke up at 9 AM. It didn’t matter ultimately, since they both managed to write thousands of pages of high quality prose. How? By organizing the rest of their days well enough. Neither of them waited for inspiration. In fact, not one famous writer does that. All of them follow their morning routines. Strictly. And that’s an order… coming from a retired US Navy admiral. “If you make your bed every morning, you will have accomplished the first task of the day. It will give you a small sense of pride and it will encourage you to do another task and another and another. And by the end of the day, that one task completed will have turned into many tasks completed. And if by chance you have a miserable day, you will come home to a bed that is made. That you made. And a made bed gives you encouragement that tomorrow will be better. It might sound funny or even silly. But it works. It’s a tiny habit worth keeping. Even if you know nothing about psychology, you may have already heard about Pavlov and his dogs. If you haven’t, the story goes something like this. Ivan Pavlov, a Russian Nobel laureate, discovered something fascinating by chance. Every time before feeding his dogs, Pavlov would ring a bell to summon them. After a while, he noticed that the dogs would start salivating whenever they heard the bell ringing. They didn’t know if they were getting food. Their brain simply learned to associate the ringing with the meal. This is conditional reflex and it’s something that can be controlled. Well, the human body works the same way. If you do something you really like the moment you get out of bed, soon enough you’ll really want to get out of bed. “It totally works”, says Scott Adams, the creator of Dilbert comic strip. For example, I typically look forward to my mornings because that’s when I drink my hot coffee and read an interesting book. And since we have little kids in the house, I set my alarm to 1 hour before everyone else wakes up. This way I’m starting my day in Active mode (instead of Re-active). This sentence has been quoted in thousands of studies. Hell, it’s even in the title of the most famous self-development book by Brian Tracy! What it essentially means is that it’s best if you start your workday by doing your hardest and most important task first. After all, if you have no choice but to eat the frog, what good would looking at it do? It will merely take away the pleasure from whatever else you’ll be doing in the meantime. And “meantime” is the right word. Because everything is meantime if the frog is still on the plate. Even your little triumphs are by-products of procrastination. Just eat the frog and everything else will be much more enjoyable! Which brings us to another little tip. When you write your daily task list – put a star beside the task that is your “frog”. This will be the task you’ll do first. It’s easy to get lost in daily tasks and activities. After a while, its possible to loose meaning. That’s why its best, from time to time, to reflect on the purpose of your activities and the meaning of your day. They say that every morning Steve Jobs asked himself a simple question. Whenever the answer would be “No” for too many days in a row, Jobs was sure that he needed to change something about himself. Improving your morning routine is a good step toward passing the Jobs’ test. Have questions or comments about Morning Routines? Screen vs Paper – What’s better for productivity?